This afternoon I had an appointment in Shinagawa in Tōkyō so I decided to pay a visit at the nearby Shingon temple which I had been to before. The Kōyasan Tōkyō Betsuin is a branch temple of Kōyasan Shingon-shū. Shingon is the Japanese school of Vajrayāna that dates back to the founder Kūkai 空海 (774–835). Kōyasan itself is situated in Wakayama Prefecture, which is some distance away from Tōkyō. Fortunately they built a branch temple in Tōkyō. Here is a view of the front of the temple. Here is another view looking down towards the main door. Entering the main hall one sees Kūkai seated at the center behind the altar. On the right side of the main hall there is a statue of Yamarāja. One will recall that Yama is also present in classical Indian mythology. In the Vedas he is the god of the dead. The departed spirits are said to dwell with him. He was the son of the sun and had a twin sister Yamuna or otherwise known as Yamī. Some say they were the first human pair. In later mythology he came to be one of eight Lokapāla, the guardian of the south, judge of the dead and ruler of Yamadevaloka. In contrast to these ideas, in the Buddhist mythology he is said to be the regent of the Nārakas and residing in a palace of copper and iron in the south of Jambudvīpa. The main altar has numerous Bodhisattvas and deities including Kṣitigarbha, Rāga-rāja 愛染明王, Kūkai, Acala 不動明王 and Avalokiteśvara. Here is Rāga-rāja. The quality of the photo is poor because I was unable to get closer, but here is an image of what the deity usually looks like. He is a vidyārāja 明王 or luminous king which is basically a deity in esoteric Buddhism who is a manifestation or messenger of Buddha Vairocana's wrath against evil beings. His true identity is Mahāvairocana 大日如來 or Vajragarbha-bodhisattva 金剛薩埵. His name Rāga-rāja literally means "King of Love". This is because of his great love for the Buddha who also protects him. He also loves all sentient beings and works for their benefit. He is usually portrayed as having six arms and three faces displaying anger while holding a bow and arrow. The other vidyārāja is Acala. Again, the quality of the photo is not so good, so let us look at a better one. Acala is the chief of the five vidyārāja. His appearance is awesome, fierce and frightens evil beings. 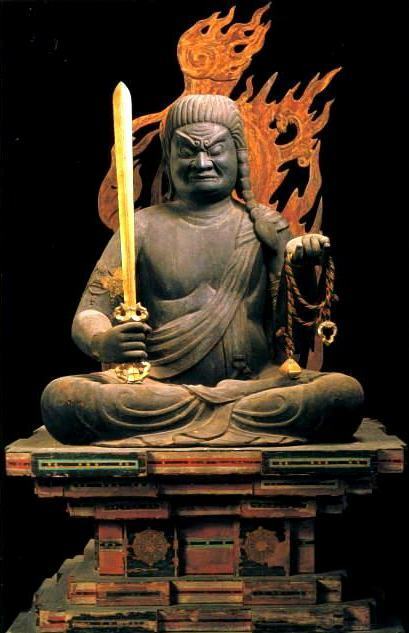 He holds a sword which symbolizes wisdom, a noose and a thunderbolt. He is youthful in appearance, strong and has long hair thrown over his left shoulder. 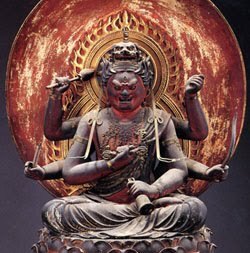 He is quite a prominent esoteric Buddhist deity in Japan. Encircling the main shrine are portraits of the prominent patriarchs in the Shingon lineage. Here is Nāgabodhi 龍智. Nāgabodhi is said to have been a South Indian monk who was initiated into esoteric practises by Nāgārjuna in the 2nd or 3rd century. This is also said to be the case in Tibetan traditions. Next to Nāgabodhi is Amoghavajra 不空金剛. Amoghavajra (705–774) was a prominent translator and influential Buddhist leader during the Tang Dynasty. He was born in Samarkand. His father was Indian and his mother Sogdian. Following his father's death he travelled to China at the age of ten and in 719 he ordained under Vajrabodhi 金剛智. In 741 all foreign monks were expelled and so he travelled to Sri Lanka, South Asia and India to collect texts and finally returned to China in 746 with numerous texts in hand. Besides translating numerous texts, he found his services, such as tantric initiations, in demand by the state. Interestingly in 765 he conducted an elaborate ritual to repel an invading army of Uighurs and Tibetans who were set to attack the capital Chang'an. One of his prominent disciples was Huiguo 惠果, Kūkai's master. Kūkai wrote an epitaph for his master which can be read here. Here is another view of the altar. The temple is really quite beautiful and well-kept. You can see the location of it here on Google Maps. Unfortunately in Japan most major temples are well outside of Tōkyō, but there are still a few temples in the metropolis worth visiting.